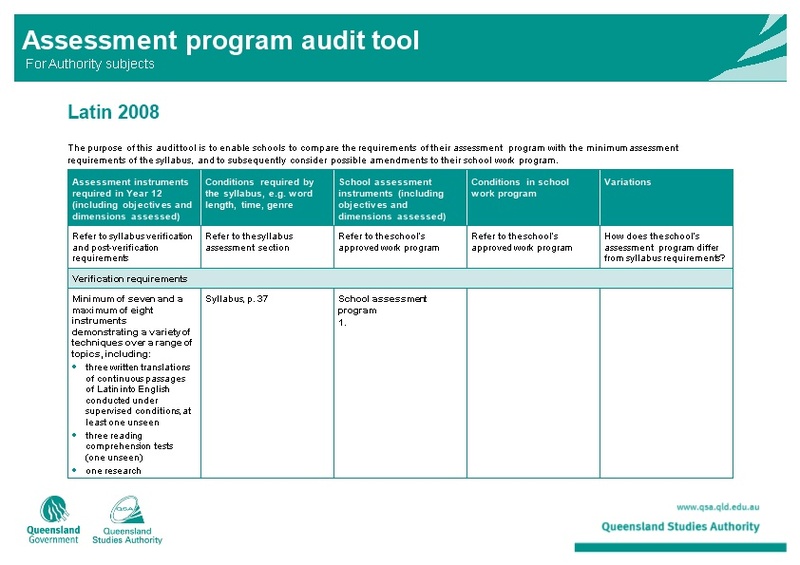 The purpose of this audit tool is to enable schools to compare the requirements of their assessment program with the minimum assessment requirements of the syllabus, and to subsequently consider possible amendments to their school work program. Refer to syllabus verification and post-verification requirements / Refer to the syllabus assessment section / Refer to the school’s approved work program / Refer to the school’s approved work program / How does the school’s assessment program differ from syllabus requirements? / Instruments require students to read and understand continuous passages of authentic Latin by a variety of authors. are these choices the most effective way to gather information about student learning? what is the rationale behind these school decisions? what changes could be made to the school’s work program? Please email or phone (07) 3864 0375.